Ben Nixon’s photographs describe a connection to history that is both geological and photographic. 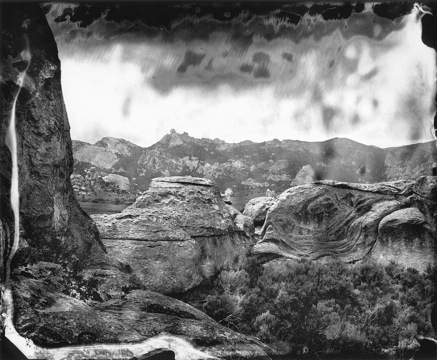 Utilizing the 19th century “collodion technique” Nixon’s photographs reference the nostalgia of the American West. The chance nature inherent in the wet-plate process suggests a distinctive mood and atmosphere steeped in the history of American lore. The collodion process is delicate and precise and Nixon’s imagery captures this quiet fragility combined with the fierce elegance and grandness of the American landscape. In much the same way Ansel Adams’ photographs paid tribute to the natural world, Nixon’s imagery explores the rough but simple beauty of canyons and gullies, pumic domes and surrounding volcanic craters wherein these images reflect a sensitivity and a passionate concern for the natural world, even as it is being ravaged and stripped away. Nixon’s exhibition is the second in the series of revolving solo shows from four San Francisco-based artists. These are the first solo exhibitions for each of these artists in Los Angeles. Ben Nixon’s “Surface Tension”: June 26, 7-10 pm. The Duncan Miller Gallery is located in West Los Angeles, 1/3 mile East of the 405 Freeway.